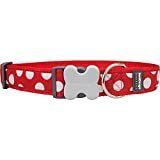 Red Dingo Dog Collar Small 20 – 32 cm x 1,2 cm (8-13″) , Red Dingo Dog collar Sizes: Small : 20 – 32 cm x 1,2 cm (8-13″) Medium : 30 – 45 cm x 1,8 cm (12-18″) Large : 40 – 60 cm x 2,5 cm (16-24″) Webbing – Premium nylon webbing, woven from quality fine yarn for a softer feel. Densely woven edges for maximum abrasion resistance. Exceeds ISO standards for washing and UV colour fastness. D-Rings – Fully welded from solid stainless steel. D-rings will not rust and therefore will not discolour pet’s fur. Bucklebone – An original Red Dingo trademark and registered design. ‘Bucklebones’ are designed not only to look good, but to be amongst the strongest side release buckles used in the pet industry. 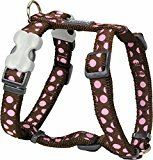 Dog Harness Look also at the Matching Dog Lead on Amazon!! Webbing-high density nylon woven tightly for maximum durability. The Red Dingo Dog Harness is a unique design that’s easy to put on your dog, and keeps them safe. There’s just the one snap buckle and all the straps are adjustable. To put the Harness on, it slides over your dog’s head and left front leg go through the opening, the strap with the buckle comes up behind the right front leg, then snap the buckle and you’re set! There’s no pressure on the neck, and the lead ring is behind the shoulder blades. The snap buckle, or Bucklebone (a registered design) is fantastic and easy to clasp and undo.